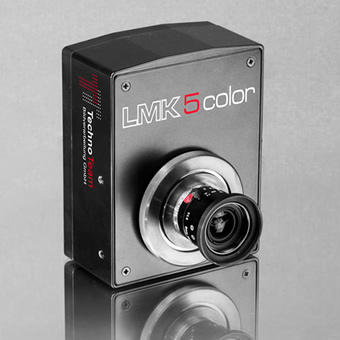 The LMK 5 color is equipped with a glas filter wheel for color and chromaticity measurements, adapted to the CIE color matching functions of the 2° standard observer (CIE 1931). Thus, luminances and color coordinates can be measured in a spatially resolved way. In addition, the measuring system can also be equipped with glas filters for the scotopic luminance V´(λ), the circadian action function C(λ), an IR-filter (measurements in the NIR range of 780 – 1000 nm), a BLH (blue light hazard), or a clear glass filter. 1 Measurements according to DIN 5032 Part 6/CIE Pub. 69 | 2 Dominant wavelength, saturation, correlated color temperature | 3 Calibration according to DIN 5032 Part 6 using a luminance standard led back from the Physical-Technical Federal Institute | 4 Measurement performed on a stabilized white LED light source L=100cd/m². Mean value over 100 Pixel; repeatability as variability of the mean value.